Harrisburg, PA – As part of Governor Tom Wolf’s commitment to create Jobs That Pay and support business investment and expansion, the governor’s Middle Class Task Force met today in Pittston, Luzerne County. This is the third of six meetings the panel of leading business, labor, education and workforce development experts is holding to hear from Pennsylvanians about their concerns and ideas to improve the lives of middle class families. 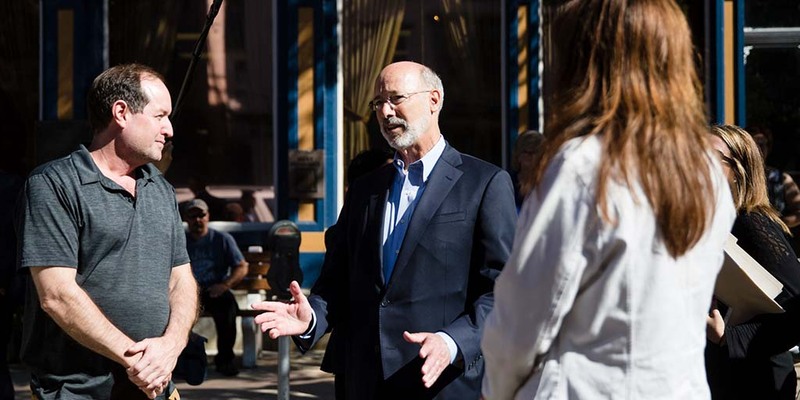 “We have made historic investments in education and expanded workforce training in Pennsylvania, but more must be done,” said Governor Wolf. “Throughout the state, we hear from businesses that cannot find skilled workers and people who cannot find jobs. To bridge that divide, this panel is opening communication and sharing ideas that will help us tackle these challenges. Susie Snelick, Pennsylvania Workforce Development Association Chairperson. During the open discussion the task force heard from local businesses and labor leaders, educators, and workforce development experts, as well as job seekers and students. The Wolf administration is supported on the task force with representatives from the Department of Community and Economic Development, Department of Education, and Department of Labor and Industry. The task force will present recommendations to the governor later this year.